DAYTON, Ohio -- A large crowd chanted “Build that wall,” to welcome Republican front-runner Donald Trump to the Buckeye State Saturday. “Is anything more fun than a Donald Trump rally?” Trump said. The Dayton rally took place one day after a rally in Chicago was canceled due to safety concerns and protests. There were no major issues at the Dayton event; some protesters were removed from the event and one was arrested. Toward the end of his address to the crowd, a screaming protester made a move toward Trump near the stage, causing his security to form a quick circle around him. 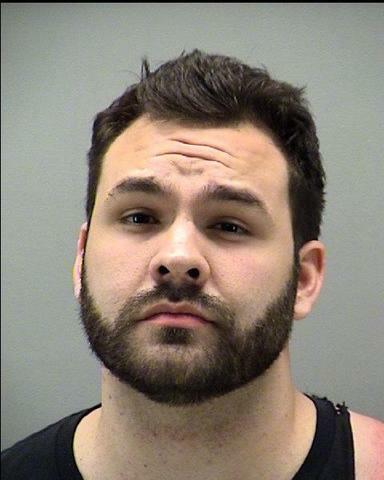 The protester, identified as Thomas Dimassimo of Fairborn, was arrested after jumping the stage, WHIO reported . Dimassimo, 32, was arrested and accused of disorderly conduct and inducing panic, Montgomery County Sheriff Phil Plummer told WHIO . 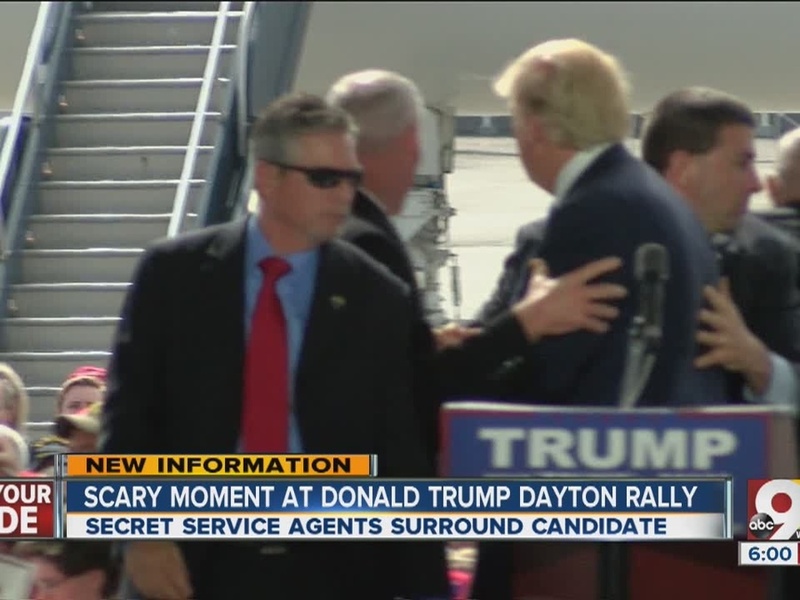 @WCPO - Secret Service surrounds Donald Trump on stage as protester moves toward him. Protester escorted out. Trump went after his GOP challengers Florida Sen. Marco Rubio and Texas Sen. Ted Cruz in the first few minutes of the Dayton address. “Ted lifts up that Bible, then he puts it down and he lies,” Trump said of Cruz. 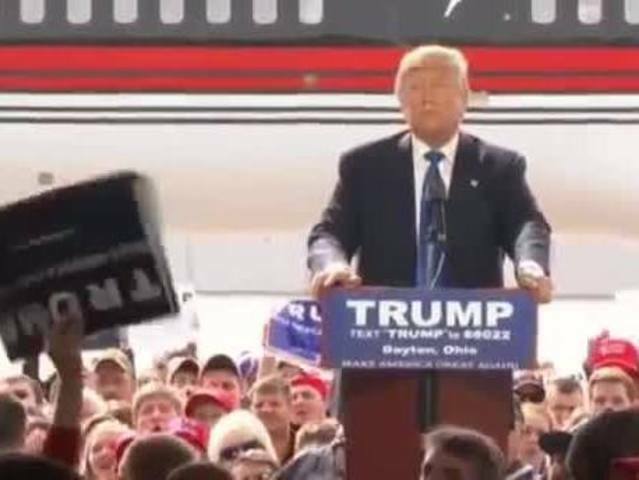 Trump also slammed Ohio Gov. John Kasich for his work at Lehman Brothers and his vote for NAFTA as a congressman in the 1990s. Trump and Kasich are locked in a tight race in Ohio with only three days until the state's primary. “He’s not tough enough,” Trump said about Kasich. He called Kasich “weak” on illegal immigration. At the same time less than an hour away, Bill Clinton denounced Trump at an event at the Underground Railroad Freedom Center. "I'm worried about what I saw in Chicago last night," Clinton said. "I'm worried about the tone of the debates on the other side. This has been building for a long time." John Kasich blasted Trump for violence and danger in Chicago Friday (read more about Kasich's remarks here ). "I will not seek the low road to the highest office in America," Kasich said. People in the crowd seem to be talking about everything from Bengals football to whether Trump should select Gov. John Kasich as his running mate should Trump get the Republican nomination. Others discussed the protests that canceled Trump’s rally in Chicago Friday night. The Trump campaign will make a stop in West Chester Sunday at 2 p.m. The stop was announced Saturday morning after rumors of a rally Downtown were put to rest. WCPO news partner WHIO contributed to this report and provided video footage.